The next big buzz in the mobile app market is surely Augmented Reality Based App Development. The Augmented Reality Apps enables to present the digital data on top of the real world object to both the mobile app developers and businesses. In fact, it has already begun to demonstrate its disruptive capability across many industries from retail and finance to travel and fashion, Medical and etc. During WWDC 2017 itself, Apple announced that its new Augmented Reality tool (ARkit) will bring AR apps to iOS 11. This clearly meant that the next version of Apple’s mobile platform will be AR-focused in a big way. Let's understand what this iOS ARkit is? Basically, it is a mobile AR platform for developing augmented reality apps on iOS. It has a great level, session-based API that presents an easy interface to a powerful set of features. In another way, it can be defined as a new framework that allows to create exceptional augmented reality experiences for iPhone and iPad. How the augmented reality app development Benefit Business? With Augmented Reality, showcasing products has become quite important. Earlier, the retailers and manufacturers used to create an atmosphere in their respective showrooms, that would visualize the actual forefront in order to help customer. For instance, how would a study room look like in a new armchair and a transparent Book Sleeves. Well, this obviously creates huge cost for businesses and again it is disconnected for customers in terms of what a product will look like in their own home. As we know, Augmented Reality is completely opposite to the natural world. It is the fusion of the digital and the real world, where a new innovative world is created virtually. And with the help of ARKit, the developers can take apps with a new level of experience. The Augmented that it adds is generally a certain advancement like 3D images, sounds, action with the GPS data, and aforementioned makes the available prospects additionally informing and convincing. Further, to enhance the apps, ARKit also make use of Visual Inertial Odometry (VIO) to track the world around. VIO has the capability to combine camera sensor data with CoreMotion data. And of course, this ARKit is compatible to run on the Apple A9 A10 and A11 processors with the same ease. Augmented Reality has the power to change the view of reality by augmenting the available components in the environment. 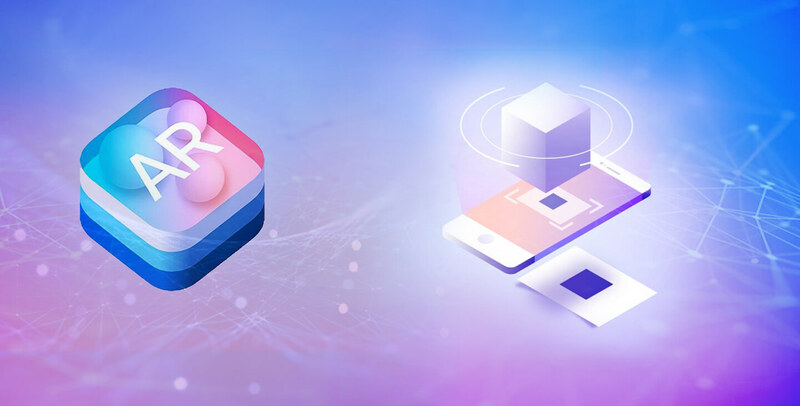 Understanding the importance, iOS App Development Company aims to deliver custom augmented reality apps that offers one-of-a-kind user experience, increase brand awareness, and improve customer loyalty. For better custom augmented reality apps development hiring top mobile app development company can fulfill expectations to the full. Thus, with the augmented reality apps, different industry vertical can enhance the outlook. It allows to business to take customers to digitally manipulative and interactive surrounding that gives a real-world interface. Firstly, the user’s interactions data is collected and sent for processing. Cameras present on the devices scan the surroundings and based on this info, a device locates physical objects and creates 3D models. It is distinctive duty cameras, like in Microsoft Hololens, or common smartphone cameras for capturing pictures/videos. Eventually, AR devices act like little computers, that's already done via modern smartphones. likewise, it also requires CPU, a GPU, flash memory, RAM, Bluetooth/WiFi, a GPS, etc. This enables to estimate speed, angle, path, orientation in space, and so on. This refers to a minute projector on AR headsets, which exerts data from sensors and projects digital content (the result of processing) onto a surface to view. However, the use of projections in AR partial and yet to bolster it in commercial products or services. Some of the AR devices have mirrors to assist human eyes that allows viewing of virtual images. Others may have “collection of small curved mirrors” and similarly some can have a double-sided mirror to reflect light to a camera and user’s eye likewise. The purpose of reflection paths is to deliver a precise image alignment. It is expected that by 2021, the AR industry is expected to hit $83 billion and will benefit different industry to enhance their process much simpler and easier. Industries that are influenced by the Augmented Reality! The Augmented reality apps are playing a crucial role in the healthcare industry. It offers a great benefits from viewing the symptoms to assisting in figuring out veins, the AR apps are helping to carry out the process easily. With the arrival of AR apps, the gaming has become much more entertaining and fun. Well combing the AR in mobile games allows placing the person's first views in better perspective. This technology has taken real estate to a very advanced level, by powering it to showcase properties from the 3D perspective. This is beneficial for both the property owner and property seekers. Augmented reality can be used in a different context, helping businesses to move customers through the purchase funnel. By developing augmented reality apps, the retailer can reinvent the brand and establish an interactive relationship with customers offering a richer user experience. For instance; A car design, which can be manipulated for creating the 3D virtual part, which can be then projected into view by an AR mobile apps. Also, it renders the optimizations benefits for ARKit in MEtal, SceneKit. Also its helpful for third-party tools like Unity and Unreal Engine. The Augmented Reality App extends the power that has the capability to enhance business with so call advanced augmentation, which can establish a better connection with both the new and existing customer. The interactive experience offered by the Augmented reality is beyond the screen which channelizes the two-way communication between customers and the brands. You can also take your business to the next level of advancement by the Augmented Reality Apps. Be the earlier Adopter of technology to get benefitted!